When my daughter came home from school talking about a “keyboarding class” a couple of years ago, I assumed she was talking about a music class. It took a little more conversation for me to understand what she was talking about. “Oh, TYPING class”, I exclaimed as communication finally dawned. “What’s typing class?” another child asked. 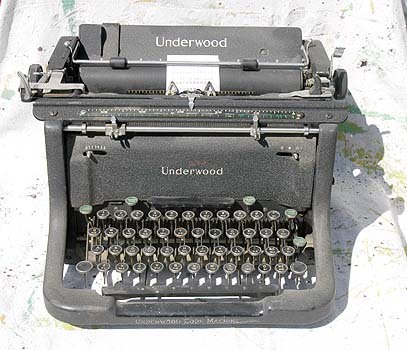 Yet another reminder of my quickly solidifying status as an “old fart.” Those of you who know what an Underwood or an Olivetti are will probably appreciate this article. (The Digital Generation Rediscovers the Magic of Manual Typewriters). Now I like a good typewriter as good as anyone, but do you really want people carting in a Royal Quiet De Luxe Portable or their trusty IBM Selectric to the neighborhood Starbucks? Something has evolved for me over the past couple of years that resembles the community evident in Kornheiser’s Yom Kippur golf outing. It is what I “wanted” but looks different than I expected. A few months after that blog post, I started a conversation with several friends facilitated through a private blog. It is a group of friends who trust each other implicitly, enjoy spending time together whenever we can, and who are a source of encouragement and challenge that make life better just knowing they are there. We have a lot of things in common, but we differ on MANY things as well…politics, theology, religion, even continents. But unlike many institutional forms of “community”, these differences haven’t seemed to hinder the friendships. In fact, the relationships have probably grown deeper through the differences. More specifically, the growth has occurred through the trust to share those differences out in the open without fear of reprisal. Which brings me to another observation from Mr. Tony’s radio conversation. 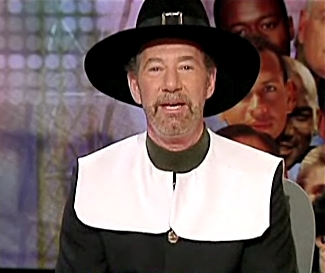 Tony Kornheiser and David Aldridge’s skepticism toward religious institutions is clearly articulated. Their experiences of and attitudes toward these institutions are shared by many people in society today. We have all heard those feelings expressed from many of our acquaintances, neighbors and/or co-workers. This is obviously a problem from the perspective of the institution. To address the problem, institutions have expended huge amounts of time, energy, and resources. “Outreach” programs are developed. Books are written. Consultants are hired. Neighborhoods are canvased. Small group programs are initiated. But we still hear of skepticism directed toward the church based on real or imagined stereotypes of church and religion. I’ve come to believe we are not going to create the type of community people hunger for by introducing more programs, or slick marketing campaigns. What to do? “Start what you need.” I would suggest starting a conversation among some of your friends…a conversation that is based OUTSIDE the doors of the institutions in question. A conversation specifically intended to create the community you are looking for. Don’t force this conversation; allow it to evolve. However, be intentional. Take some risks. Share yourself…the good, the bad, and the ugly. Share the questions and the doubts as well as the definitive portions of your faith. Chances are, you and some of your friends share that same need. I have a hunch that the more community we experience in our personal lives, the more community develops in the institutions in which we participate. It’s a hunch that I’ve experienced personally…both in my friendships and in my church. A couple of years ago, after hearing something that made me write, “I want that”, I started what I needed. It’s been more than I thought I wanted. Before my current experiment of fasting from Facebook, I saw Lent in terms of the thing to be given up…sweets, or coffee, or beer, or Facebook. It was about the “nouns” so to speak. The thinking was if I denied myself some particular noun, it would be an offering of sorts to God, as if God would be pleased by the absence of that thing in my life for those 40 days. That perspective would fit with the material nature of my western worldview. We have a tendency to see the world through the colored lenses of nouns. We objectify our lives by identifying them in terms of the nouns with which we surround ourselves…our cars, our address, our clothes, our friends, our job, etc. The practice of adding some discipline helps counter this…adding a more regular prayer time, daily Scripture study, writing more regularly, etc. These practices seem to help move ones focus from the nouns. The real “rubber hits the road” moment for me in all this fasting stuff is the moment of decision, not at the front end of Lent, but daily. There is a choice to be made every time I open a web browser…to login or not. Which choice will I make? Ultimately it’s not about the actual state of being logged in or logged out. Each choice made is an opportunity for prayer…for worship. Isn’t that what the whole idea of “pray without ceasing” is all about? The spiritual formation is instilled in the particular choice made. M. Robert Mulholland defines spiritual formation as “A process of being conformed to the image of Christ for he sake of others.” (Invitation to a Journey: A Road Map for Spiritual Formation). This “being conformed” thing is a journey…a process…an action…a verb. I’m learning to view lent in terms of choices.